It was fantastic to hear the poems read aloud in the cellar bar of The Swan to an attentive and friendly audience. Competition Judge, Martin Malone, and organiser, Dawn Gorman, commented on the extremely high standard of poems this year and everyone was delighted that the number of entries (392) was almost four times as many as last year. You can probably tell from the poem titles that writers approached the subject of ‘Light’ (the competition theme) in a multitude of ways and that made the event all the more enjoyable and interesting. It was also fabulous to hear Martin read from his own work, especially new poems to do with WWI which form part of his current PhD project at Sheffield. In the end it was Lesley Saunder’s Creation poem, ‘Adam’, which was awarded First Prize, with John Glenday’s beautiful poem about his father, ‘A Pint of Light’, given Second Prize, and Roy Marshall’s densely atmospheric ‘Night Swimming’ was Third. The beermats are now in place in ten different pubs in Bradford-on-Avon for the duration of the Arts Festival which is in full flow. 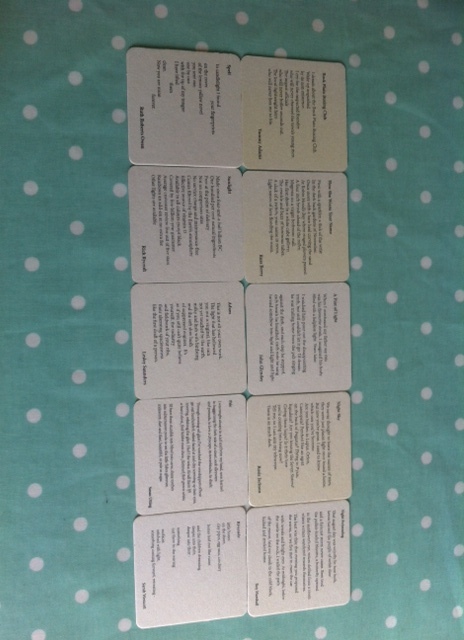 Visitors are encouraged to take part in a poetry trail, as each pub is ‘hosting’ a different poem. One of the prizewinning poets, and the daughter of publicans, Susan Utting, said, after reading her poem, how proud she was to be a part of a pub crawl! It was a splendid evening. Huge congratulations to all the winning poets whose poems can be read here, and there are brilliant photographs of the evening here. How lovely to see a face I recognise in my WordPress reader. I recognised Lesley Saunders as I’ve met her at oriental dance workshops! The most memorable one in Andalusia way back in 2003. I also know she’s a wonderful poet! Thanks for posting this blog, I’m off to read the poems now! I also saw Lesley in a dance/poetry performance piece which was very interesting. Thanks so much for commenting, Susan, and you’re in for a treat with these poems, they are all very good. My favourite is John Glenday’s.